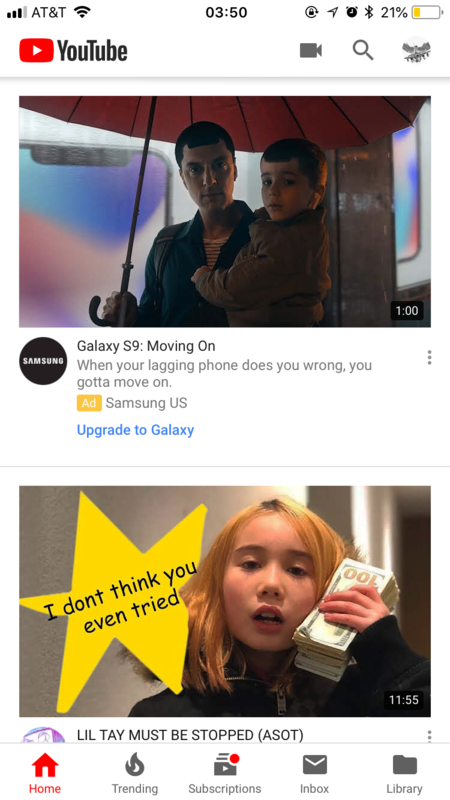 They get what they deserve if they are using any of the default Samsung bloatware. Tons of SMS/MMS alternatives on the Play Store. Didn't say they won't mention, as we've already heard about it, obviously. But they won't *care*, in the way that they *care* about any perceived Apple failing. It's not paranoia, it's based on history. Samsung phones literally burned down cars, burned holes in airplanes, grounded flights, and was barred from every major airline. No big deal judging by the media coverage. No outrage, no scandal, and next season it was business as usual. Meanwhile, tools still talk about the supposed failings of the iPhone 4's deathgrip signal attenuation, despite carrier data showing it caused no significant change in dropped calls. We've been here before. Where have you been? Yeah, even "good, but not great" Dieter Bohn, from the Verge, tweeted it. So it's official, Samsung cut their losses on "advertising" strategies this year! This means that someone at Samsung is a part of Project Mayhem. The idea is that, if you've got nothing to hide, you shouldn't be worried! How are their comments parinoia? They were making a point that this “problem”will barely be reported because it isn’t Apple, IOS or an iPhone. The trolls will stay in the woodwork because it is Samsung having the problem. This happens to Samsung, it appears on a few websites and blogs. This happens to Apple, it’s on thousands of websites, blogs, TV and radio and becomes a -gate. Sigh. So the iPhone X lagged as hell? When will they hire a smarter advertising man in their company? Also, "Moving on?" did you mean that people who bought iPhone X are losers until they switched to a S9? Freaking the worst way to advertise, totally pitiful. You’d expect a company that corrupted their nation’s politics, dropping f-bomb on their competitor, and making advertisement that makes everyone besides them looks like an idiot to do apologize? They’ll probably just smack your face and scream GTFO. No, they actually beat the customer who got a blowed up Note 7, which also destroyed his retina MacBook Pro.